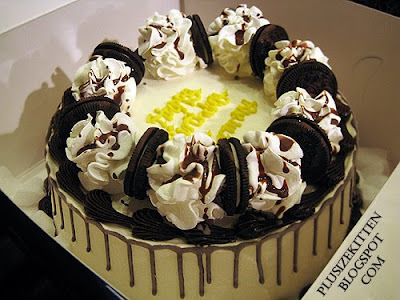 my favourite ice-cream cake from Baskins! Yeah I have a birthday cake picture yum yum. There's 2 good thing about an ice-cream cake. One it's so YUMMY right? TWO it's a PAIN TO CUT! a few people got hurt in the process of cutting this cake! including me! my finger now has a scar to show for it! (coz it's bloody stone hard the ice-cream) Anyway muahaha... was it delicious? coz I din get a bite T_T didn't know so many people aiming my cake! ok lah next time i buy bigger ok? i was broke already sob sob. 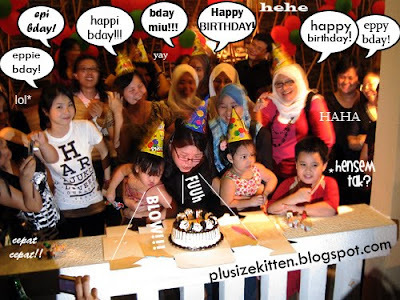 Party attended by bloggers & readers! this to show my new found friends from 2009. Thank you all for coming and for loving me as a friend. MUAKS. The cake too small, but lot of pp ah!!! The cake was biiiiiiit small but delicious! !